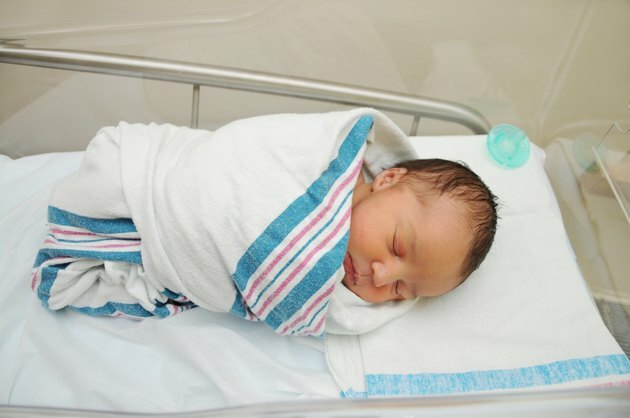 Swaddling infants was commonplace before the 18th century, and the practice is gaining a new following in the United States since swaddling babies has several benefits and very little risk. Swaddling can also benefit you as a new parent, as handling a calm newborn who sleeps well will help you to stay calm and rested. Swaddling your baby can keep him from making sudden movements and startling himself, thereby promoting sleep. The age at which you should stop swaddling varies by child, but it is generally around the 3-month-old mark. In his book, “The Happiest Baby on the Block,” Dr. Harvey Karp explains that although swaddling helps to mimic the confines of the uterus, giving babies a comforting feeling, the womb is a noisy place. He recommends the use of white noise along with swaddling to promote sleep in infants. The medical community generally concedes that swaddling your baby can help to calm her and decrease the amount of time that she spends crying. A study conducted in 2007 by researchers from Wilhelmina Children’s Hospital and the University Medical Center Ulbrecht monitored 398 babies from birth until 3 months of age, with one group being swaddled and the other group receiving normal intervention. The study concluded that swaddling does help to calm children and decrease crying only in certain age groups. The swaddled group exhibited significantly less crying between the ages of one week and seven weeks. Researchers from the Children’s Hospital Boston and the Harvard Medical School have weighed in on the swaddling debate, acknowledging that it may help your baby sleep better and cry less. They have expressed concern, however, that swaddled infants are at a higher risk of developing hip dysplasia than infants who are not swaddled. Roughly 17 percent of newborns show some signs of dysplasia that usually resolve over time without treatment. Although formal research is lacking with regard to swaddling and the prevalence of dysplasia, it is believed that swaddled babies who had a healthy newborn physical examination may develop hip dysplasia later on, particularly babies in families with a history of dysplasia or who were in the breech position prior to birth. Dr. Bradley Thach from the Department of Pediatrics at Washington University reviewed several studies relating to swaddling of infants. He concluded that since infants who are swaddled are unable to crawl in their crib or pull bedding over their heads, they are at a significantly lower risk of accidental suffocation. Always lay your swaddled baby down on his back to decrease the risk of sudden infant death syndrome, or SIDS. Before swaddling your newborn, be sure you know the proper way to do it. Wrapping your baby too tightly can cause problems with circulation or cause her to overheat, which can lead to serious medical complications, according to the University of Florida. Have your midwife or a nurse show you the proper way to swaddle to avoid any health risks. What to Do for a Restless & Sleepless Baby?